May day banner reads, 'Death to capitalism, freedom to the people'. Author's pic.On May 1, around a hundred workers gathered in the north-eastern city of Tuzla, Bosnia-Herzegovina, to celebrate labour day and protest the extremely precarious conditions they have been enduring in post-war Bosnia. Once a regional industrial hub and important centre for the country’s economic development, in recent years Tuzla has experienced a dramatic economic decay, which has translated into an average unemployment rate of 55%. Tuzla holds a record of strong civic activism and opposition to nationalist political forces throughout the most critical years of the 1990s. As many argue, this was, in part due to its strong and cohesive labour movement. Fast forward to today and the consequences of labour fragmentation on the country’s anti-nationalist ‘red city’ paint a stark picture. This colour metaphor reflects the degree to which Tuzla workers feel under political and economic attack. Party politics wants to transform the town’s leftist political identity, and align it to the predominant nationalist orientation of the surrounding areas. On Labour Day, the hundred workers have gathered in front of the burnt ruins of the former municipal building — set on fire during the protests which shook the country in February 2014 — for a demonstration called by the independent labour union, “Sindikat Solidarnosti”. When asked if they expected a bigger turnout on such a significant day, demonstrators lament the general degree of apathy and resignation amongst people, as well as the division amongst unions, some of which are supposedly close to the governing forces. “Those in the bigger unions” A. tells me ,“are just exploiting their own workers, they use the membership funds for their own private business and they never oppose the politicians or corrupt directors”. In addition, many raise the issue of fear and intimidation. According to some, their colleagues, friends and co-workers didn’t come to the demonstration because they fear being seen and recognised by their employers, thus risking losing their jobs. “Even those who have a job are paid way less than the minimum wage, and this of course causes huge damage to our struggle, since people are willing to accept any compromise… Here, people’s life is worth less than 100 marks, that’s the problem!” states E., former worker of a now bankrupt chemical industry. The situation of unemployment in Bosnia and Herzegovina, and in Tuzla particularly, has been steadily worsening since the early 2000s. Some would claim even earlier than that, when a strong wave of privatisation through controversial buy-outs meant that predatory capitalism hit all the industries and firms still left standing after the war. The Tuzla canton has a rate of 55% of unemployment, and a high number of employees who have received neither salaries, nor contributions for months. Under such conditions, how anyone can feel any sort of celebratory spirit on Labour day, is the question shared by many workers. They remember May 1 as it was once celebrated in socialist Yugoslavia. “We used to wait impatiently for this day, talking about what we would do, where we would go all together…now people don’t feel like celebrating… it’s a great fall for a city like Tuzla, which used to be the biggest industrial hub in Bosnia, even in the whole Yugoslavia!” says D., who lost her job a few years ago, at the same time as her husband did. This sentiment is common. Many remember the time of socialism as a moment where companies used to work at full capacity, and industry was prosperous. Interestingly, as argued by E., a young student of medicine “I don’t think older people are nostalgic about the socialist past. I can see that the life was better in those days. Not only the war, but what they did afterwards to our economy and education has brought such a change that it’s impossible not to look back…”. 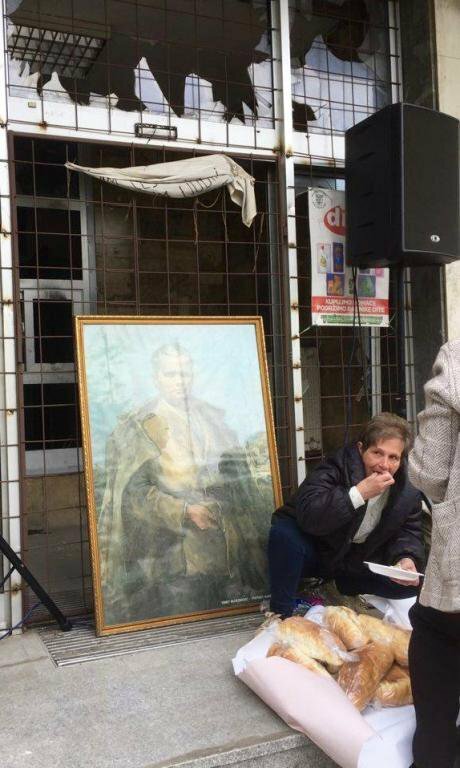 Demonstrator seated next to a portrait of Tito, enjoys meat roll provided by the union. Author's pic.And something else has been lost thanks to the red city’s roller-coaster socio-economic decay. Since the Austro-Hungarian period, Tuzla was a strong industrial hub, attracting migration from the whole region. The chemical, energy and mining industry quickly created a massive, ethnically diverse working class, strong in both number and unity. The mass miners’ strike of Husinska Buna in the 1920s exemplified this pride in its collective strength. Tuzla was the first big city to be liberated in Europe during World War 2, such achievements closely associated with the city's 'red' identity. At the first multi-party elections of 1990, right before the collapse of the Yugoslav Federation, Tuzla was the only city in Bosnia and Herzegovina to be led by a non-nationalist coalition, which ruled the city throughout the war, attempting to maintain some sort of inter-ethnic dialogue and unity while the city was under siege. Citizens of different generations and backgrounds refer proudly to the city’s uniqueness in this regard, a quality precisely rooted in the strength of its labour movement. Whether embellished by myth or not, labour solidarity has served as the glue for the city’s enduring cohesion, even when the rest of the country descended into the abyss of ethnic conflict. And Tuzla’s people hold onto this narrative in different ways and for different reasons. Moreover, they are still keen on defending Tuzla in what they perceive as a nationalist siege on all sides from political parties seeking to homogenise society through divisive economic policies. But the haemorrhaging of Tuzla’s industrial potential has had an impact that goes beyond the tragedy of unemployment and large-scale collapse of production in the country. The fragmentation and politicization of unions, the steady stream of lay-offs due to mismanagement, inefficiencies and pure and simple corruption, undermine the values of its labour movement. This is not just another story of predatory capitalism, or of failed transition in the post-Yugoslav sphere. Alienation is a common side-show to aggressive economics everywhere, but for the people of Tuzla, it strikes right at the heart of the city, and its own uniquely resilient history of struggle. At the request of my interviewees, I use their initials to ensure privacy.